The nature of the association between ghrelin, an orexigenic hormone produced mainly in the stomach, and Helicobacter pylori (H pylori), a bacterium that colonises the stomach, is still controversial. We examined available evidence to determine whether an association exists between the two; and if one exists, in what direction. We reviewed original English language studies on humans reporting circulating ghrelin levels in H pylori infected and un-infected participants; and circulating ghrelin levels before and after H pylori eradication. Meta-analyses were conducted for eligible studies by combining study specific estimates using the inverse variance method with weighted average for continuous outcomes in a random effects model. Seventeen out of 27 papers that reported ghrelin levels in H pylori positive and negative subjects found lower circulating ghrelin levels in H pylori positive subjects; while 10 found no difference. A meta-analysis of 19 studies with a total of 1801 participants showed a significantly higher circulating ghrelin concentration in H pylori negative participants than in H pylori positive participants (Effect estimate (95%CI) = -0.48 (-0.60, -0.36)). However, eradicating H pylori did not have any significant effect on circulating ghrelin levels (Effect estimate (95% CI) = 0.08 (-0.33, 0.16); Test for overall effect: Z = 0.67 (P = 0.5)). We conclude that circulating ghrelin levels are lower in H pylori infected people compared to those not infected; but the relationship between circulating ghrelin and eradication of H pylori is more complex. The relationship between ghrelin, a 28-amino acid peptide secreted primarily by the oxyntic cells of the stomach  and involved in body mass regulation, and Helicobacter pylori (H pylori), a bacterium that colonises the stomach, has remained controversial. The first report suggesting an association between the two was that by Nwokolo et al  who examined the effect of H pylori eradication on plasma ghrelin levels in 12 healthy adult male and female subjects. They reported that eradicating H pylori from the subjects was associated with an increase in plasma ghrelin levels. At about the same time, Gockel et al  reported that H pylori had no effect on plasma ghrelin levels in a study of 39 age- and BMI-matched H pylori positive and negative women. Subsequently a number of other papers, including animal studies, have explored this relationship [4–7]. A number of review articles have also appeared exploring this relationship [8, 9]; but none of these has been conducted systematically. Considering the putative role of ghrelin in body mass regulation, understanding this association could help in maximizing its benefits, and also provide further insight into the physiology of appetite and body mass regulation. The objective of this review is to examine available evidence to determine whether or not a relationship exists between ghrelin and H pylori infection; and where one exist, to investigate the direction of the association. Specifically, this review sets out to answer three questions: 1) Is H pylori infection associated with circulating ghrelin levels? 2) what is the effect of eradicating H pylori infection on circulating ghrelin levels? ; and 3) what is the effect of H pylori infection on ghrelin producing cells in the stomach? A comprehensive search of the scientific literature (Medline (OVID), OvidMedline (R) 1950 - October Week 2 plus In-process & Non-indexed citations, Embase (1980 to 2010 week 41), and ISI Web of Knowledge) was conducted using the search terms "ghrelin AND helicobacter pylori". The search was repeated several times. The last search was conducted on October 29, 2010. Further searches were conducted using Google scholar; while the bibliography of original and review articles were searched for studies with ghrelin and helicobacter pylori in their titles. 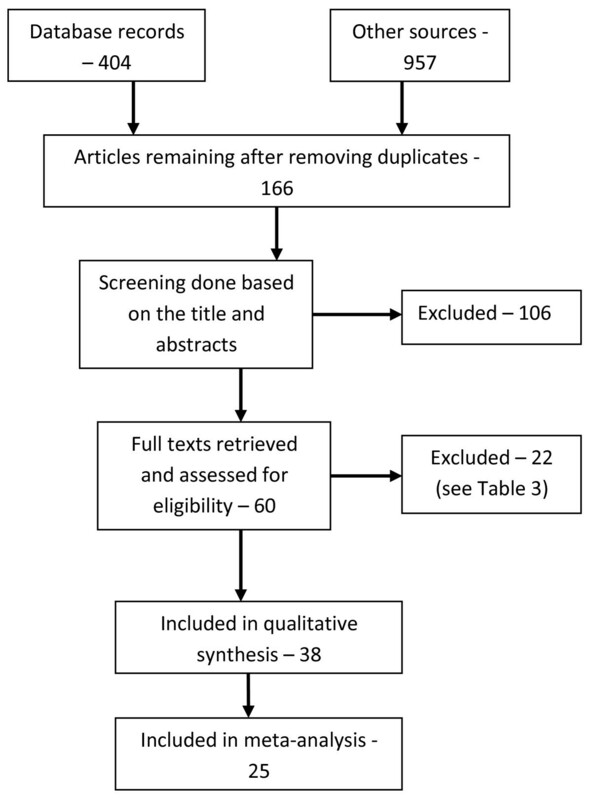 Duplicate searches were first removed; thereafter, the abstracts of retrieved articles were reviewed for relevance prior to accessing the full paper. Only English-language primary studies on humans were included provided that the authors assessed at least one of the following: 1) compared circulating ghrelin concentration in H pylori positive and negative subjects; 2) compared the effect of eradicating H pylori on circulating ghrelin levels; or 3) compared gastric ghrelin in H pylori positive and negative subjects or changes in gastric ghrelin after H pylori eradication. Letters in response to published articles, commentaries, and editorials were excluded. Conference abstracts that had not been published as full papers were included where the full abstracts could be retrieved, provided that such conference abstract contained enough information for either the qualitative or the quantitative synthesis. However, where a conference abstract has been published as a full paper, the full paper was retrieved and the conference proceeding excluded. Efforts were made to contact authors of conference abstracts whose full paper publications could not be traced to inquire if the paper had been published as a full paper and if not, to get further details about the study. Efforts were also made to contact authors of papers where some relevant information was missing to request for the missing information or for further clarifications. We contacted 18 authors [2, 6, 10–25]; but only nine authors [2, 14, 18, 21–26] responded and provided the needed information. We were unable to contact one author . We also attempted to group the papers reviewed by study teams in other to assess the spread of the papers reviewed. In deciding whether different papers were published by the same research groups, similarity in authorship was examined. Where at least one author contributed to different publications, those publications were deemed to have emanated from the same research group. Outcomes evaluated included: differences in circulating ghrelin levels between H pylori positive and negative subjects; changes in circulating ghrelin concentration after H pylori eradication; differences in ghrelin mRNA between H pylori positive and negative subjects; changes in ghrelin mRNA after H pylori eradication; differences in ghrelin immunoreactive cells between H pylori positive and negative subjects; changes in ghrelin immunoreactive cells after cure; correlation between ghrelin immunoreactive cells with severity of H pylori infection; correlation between gastric and plasma ghrelin; correlation between ghrelin mRNA and plasma ghrelin; and correlation between cells and plasma ghrelin. The data extracted were classified into three classes: 1) data comparing circulating ghrelin concentration in H pylori positive and negative subjects; 2) data comparing the circulating ghrelin concentration before and after H pylori eradication; and 3) data assessing any of the gastric ghrelin parameters. Each of these classes was supposed to answer a specific question (Table 1). The variables were re-coded in forms that would make analysis easier (Table 2). Table 3 lists the papers excluded from the review and the reasons for their exclusion. Is H pylori infection associated with circulating ghrelin levels? What is the effect of eradicating H pylori on circulating ghrelin levels? What is the effect of H pylori infection on ghrelin expression in the stomach? Simple proportions were used to determine the frequency of occurrence of each categorical variable considered; and association between different variables assessed using Fisher's exact chi2 test. Continuous variables like sample size and duration of follow-up was initially summarized using medians and inter-quartile ranges and later categorized as shown in Table 2. Multiple logistic regression analysis was used to assess confounding. The descriptive analysis was conducted using Stata version 8 (StataCorp LP, College Station, Texas, USA). We conducted meta-analyses of summary statistics from individual studies that compared circulating ghrelin levels between H pylori positive and H pylori negative subjects; and for studies that compared circulating ghrelin levels before and after eradication of H pylori. For each study, the mean circulating ghrelin concentrations and standard deviations (sd) for the different comparison groups were used to generate standardized mean differences (SMDs) and 95% confidence intervals (95% CI) since different studies used different units to measure ghrelin concentration, and some studies measured plasma ghrelin while others measured serum ghrelin. For studies that reported standard errors of mean, standard deviation was derived using the formula provided in the Cochrane Handbook of clinical reviews: SD = SEM × √N (http://www3.interscience.wiley.com/homepages/106568753/handbook.pdf). Studies that reported only medians and 95% CI or interquartile ranges (IQR) [2, 6] were not included in the meta-analysis. Table 4 lists studies excluded from the meta-analysis and the reasons for their exclusion. Study specific estimates were combined using the inverse variance method with weighted average for continuous outcomes in a random effects model. Heterogeneity was assessed using the chi-squared method and the I2 method described by Higgins et al [28, 29]. For studies that reported different sub-groups separately [30–32] those sub-groups were included as separate papers in the meta-analysis. Chuang et al,  reported ghrelin levels for males and females separately. While the data for males did not increase the heterogeneity of the studies, inclusion of the data for females introduced significant heterogeneity to the analysis. All the papers that resulted in significant heterogeneity of the studies in the meta-analysis were removed from the meta-analysis. A separate meta-analysis conducted for this sub-group of excluded studies revealed a significant heterogeneity (P=0.0001; I2 = 86%) and the effect size was very small and not significant (SMD -0.13 [-0.33, 0.06], Test for overall effect: Z = 1.36 (P = 0.17)). These papers were therefore completely excluded from the meta-analysis and described in a narrative. Sensitivity analysis was conducted to assess the contribution of each study to the pooled estimate by excluding individual studies one at a time and recalculating the pooled SMD estimates for the remaining studies. Funnel plots were used initially to assess publication bias and later confirmed using Begg's and Egger's tests. The meta-analyses were conducted using Review Manager Version 5 (RevMan 5; http://www.cc-ims.net/revman/download), while the Begg's and Egger's tests were conducted using Stata version 8 after downloading the installation files for the tests from the internet. The literature search yielded 1361 papers (404 from databases and 957 from Google Scholar) plus one unpublished paper. After removing duplicate articles, reviews, commentaries and letters (written in response to published articles), 166 papers (including one conference abstract and one unpublished paper) were left. These were further screened using titles and abstract to assess for eligibility, resulting in the exclusion of 106 articles (Figure 1). The full texts of the remaining 60 articles (excluding the conference abstract) were retrieved. 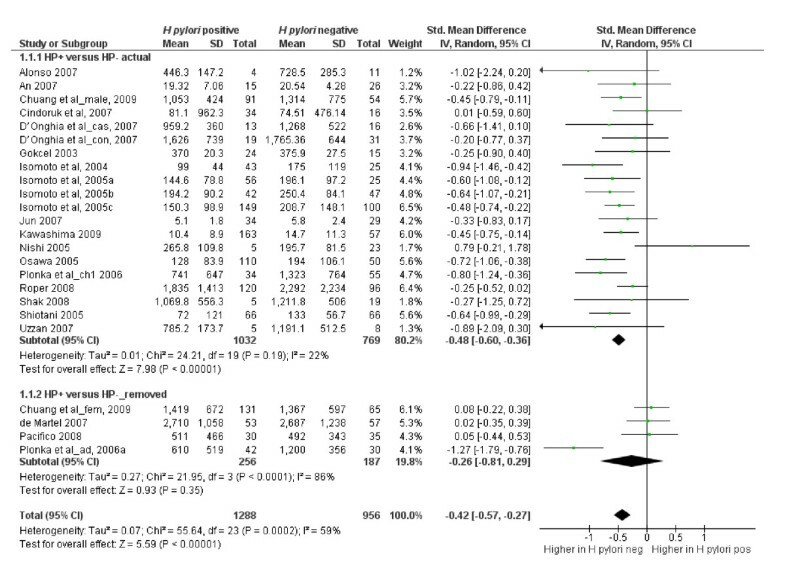 Twenty-two papers were subsequently dropped from the review (Table 3), and another 11 from the meta-analysis (Table 4). The numbers of H pylori positive and negative participants were not provided and the authors did not respond to requests for further information. Table 5 is an evidence table of studies that compared circulating ghrelin levels in H pylori positive and H pylori negative individuals. Twenty-six studies compared circulating ghrelin levels between H pylori positive and negative subjects. The analysis of one of the studies  was stratified by gender, yielding different results; this study was therefore entered into the evidence table as two separate papers with each gender representing one paper, bringing the total number of papers reviewed to 27. One paper  was not included in the evidence table because the grouping of the subjects studied did not permit a straight forward comparison of the H pylori positive and H pylori negative subjects. The paper was therefore reviewed in a separate narrative. Table 6 summarises the characteristics of the studies included in the evidence table. Most of the studies (77%) investigated both males and females, 85% studied only adults and 52% studied sick subjects mainly subjects with gastrointestinal symptoms (64.7%) and Cancer (17.65%). Thirteen (48.2%) of the studies [15, 21, 30, 33–41] were conducted in Asia; 11 (40.7%) [3, 11, 12, 17, 19, 26, 31, 32, 42–44] in Europe and three (11.1%) [14, 18, 45] in North America. Twenty-two percent of the studies reviewed were contributed by one research group alone, while Japan contributed 30% of the papers. More than two-thirds of the studies used radioimmunoassay to measure serum or plasma ghrelin, 55.6% assessed H pylori using two or more methods, and in all the studies except one, samples were collected after overnight fast. All comparisons were based on the pre-meal ghrelin levels. In most of the studies (70.4%), the samples were stored at a temperature of -70°C or below until analysed; ghrelin was measure in plasma samples in 63% of the studies, while the participants were of normal weight in 58% of the studies. The sample sizes for the different studies ranged from 13 to 538 (median: 89; IQR: 62, 180). * These are from the same paper reporting the same study but were separated because the analysis was stratified by gender and the results for males and females were completely different; hence the decision to separate them. Overall, 17 studies (63%) reported that circulating ghrelin concentrations were lower in H pylori positive subjects. Ten studies from Asia (76.9%) and seven from Europe (63.6%) found that circulating ghrelin levels in H pylori positive subjects were lower compared to H pylori negative subjects. The rest of the studies, including the three from the USA did not find any difference between H pylori positive and negative subjects. There was a weak association between the region of the world where the study was conducted and the finding of a lower circulating ghrelin level in H pylori positive subjects compared to H pylori negative subjects (Fisher's exact test = 0.07). This completely disappeared after controlling for gender, age, health status, type of sample used, storage conditions, BMI, and the sample size. Zub-Pokrowiecka et al  investigated ghrelin changes in the plasma and gastric mucosa among participants with various gastric diseases. Their subjects were divided into four groups - Group 1 had gastric cancer and concomitant H pylori infection; group 2 had antral gastritis, duodenal ulcer and H pylori infection; group 3 had atrophic gastritis of the fundus and corpus of the stomach but no H pylori infection; while group 4 had no gastric lesions and no H pylori infection. These researchers reported that the fasting plasma ghrelin concentrations varied among the different groups as follows (in descending order): group 2, group 4, group 1 and group 3. Twenty-one of the 26 studies reviewed in this section qualified for inclusion in the meta-analysis. Of these 21 studies, three studies provided ghrelin values for the different categories of subjects studied. Chuang et al  presented their results by gender; D'Onghia et al  presented their results according to whether the subjects were healthy controls or had colo-rectal cancer; and Plonka et al  presented their results for adults and children separately. Because each of these features could affect the circulating ghrelin concentration, the different categories were entered into the meta-analysis as separate papers bringing the total number of papers included to 24 with a total of 2244 participants. Table 4 lists studies excluded from the meta-analysis. Four papers were subsequently removed from the final analysis because they added significant heterogeneity to the analysis (Figure 2). The analysis showed that circulating ghrelin concentration was significantly lower in H pylori positive participants than in H pylori negative participants (Effect estimate (95%CI) = -0.48 [-0.60, -0.36]). 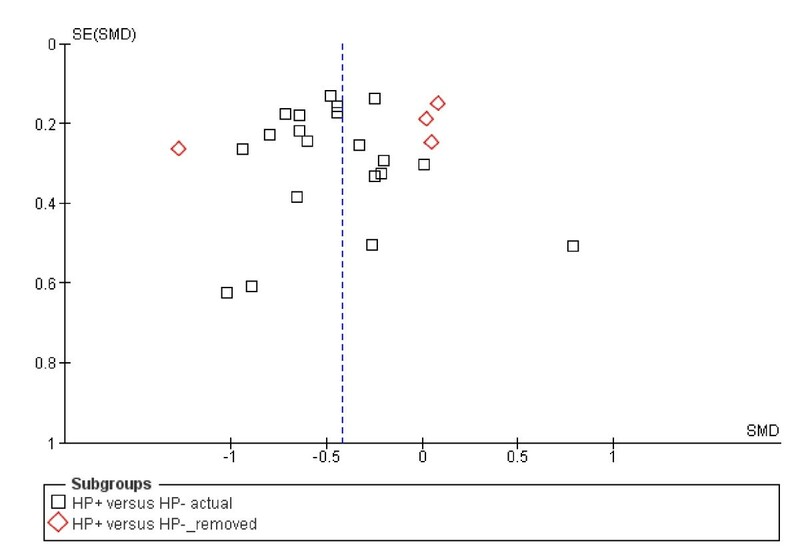 Figure 2 is a forest plot of SMDs of circulating ghrelin concentration between H pylori positive and H pylori negative subjects. There was no significant heterogeneity among the studies (Heterogeneity: Chi² = 24.21, df = 19 (P = 0.19); I² = 22%). 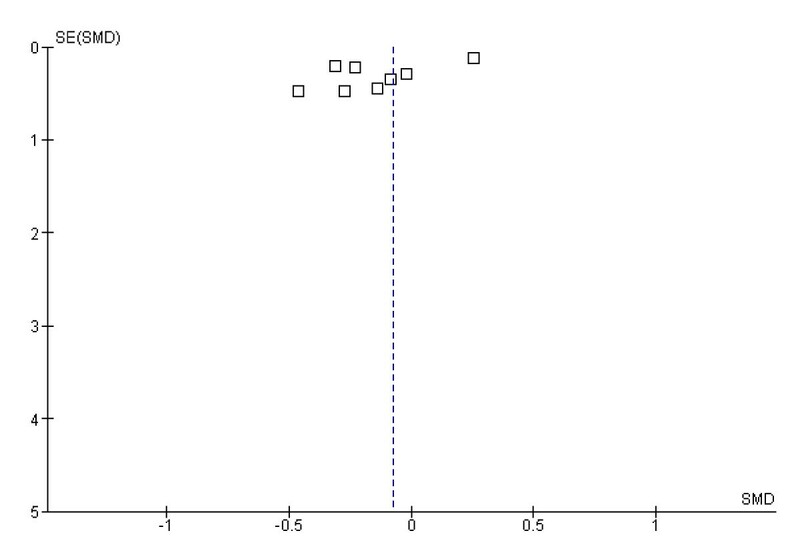 Examination of the funnel plot (Figure 3) suggests some publication bias but the Egger and Begg's tests indicated no publication bias (Begg's test: z = 1.20 (continuity corrected), P = 0.23 (continuity corrected); Egger's bias coefficient = -59.99, P = 0.116). A sensitivity analysis indicated that all the studies included in the meta-analysis contributed approximately equally to the pooled estimate (Table 7). Three of the studies dropped from the meta-analysis did not find any difference in the circulating ghrelin levels between H pylori positive and H pylori negative subjects [14, 26, 30]. However, Plonka et al  found a significantly lower circulating ghrelin levels among a group of H pylori positive Polish shepherds compared to their H pylori negative controls. Adding these four papers (excluded because of heterogeneity) only slightly increased the effect estimate (-0.42 [-0.57, -0.27]) but still showed that H pylori infection was associated with a lower circulating ghrelin concentration. Table 8 presents an evidence table of the studies that reported the effect of eradicating H pylori on circulating ghrelin levels. Thirteen papers were reviewed 12 of which were cohort studies and one RCT. Five of the 13 studies were conducted in Japan; 3 in Korea (both in Asia) and four in Europe. The only study from Africa was an unpublished paper by our team. Table 9 is a summary of the characteristics of the studies in Table 8. In 11 studies, the subjects fasted overnight, and for 3 hours (between 6am and 9am) in one study, before being bled. Osawa et al  did not indicate whether their subjects were fasted or not. The sample sizes varied from 3 to 134; median value was 16 (IQR: 9, 43). The duration of follow-up varied from 4 weeks to 52 weeks (median follow-up time: 4.5 weeks; IQR: 4 weeks, 12 weeks). Jang et al  were not clear on the duration of follow-up of their subjects. In seven studies (53.9%) there was no significant difference in circulating ghrelin levels pre- and post H pylori eradication. Three studies (23.1%) reported an increase above the pre-eradication level while 3 (23.1%) reported a decrease below the pre-eradication levels. Cross tabulation of the following variables with change in circulating ghrelin levels following cure of H pylori infection did not show any association: the age of the participants, the type of sample used, duration of follow-up, sample size, weight of participants, temperature at which the blood samples were stored, the assay kit used to measure circulating ghrelin, the number of methods used to assess H pylori, gender, country and the region where the study was conducted. Although not statistically significant, the circulating ghrelin concentration decreased following H pylori eradication in the two studies that measured ghrelin using serum samples (Fisher's exact test 0.08). Similarly, the two studies conducted on children found a decrease in circulating ghrelin levels after H pylori cure. However, these two studies on children also utilised serum samples; while all the 11 studies conducted in adults used plasma samples. From this descriptive analysis, there is not sufficient data to make a conclusive statement on the effect of H pylori eradication on circulating ghrelin levels. Nine (out of the 13 studies reviewed in this section) were included in a meta-analysis with a total population of 592. The excluded studies are listed in Table 4. The analysis showed that eradicating H pylori does not have any significant effect on circulating ghrelin levels (Effect estimate (95% CI) = -0.08 [-0.33, 0.16]; Test for overall effect: Z = 0.67 (P = 0.5)). Figure 4 is a forest plot of SMDs of circulating ghrelin concentration pre- and post-eradication of H pylori. The funnel plot indicated publication bias (Figure 5). Thirteen studies examined the effects of H pylori infection on gastric ghrelin. This includes six cohort studies [6, 36, 44, 46–48], 2 case-control studies [40, 49], four cross-sectional studies [18, 19, 24, 37] and one randomised controlled trial . The participants included sick subjects (7), well subjects (3) and both well and sick subjects (2). Eight studies were conducted in Asia, two in France, one each in Poland, Brazil and USA. Ten studies recruited both males and females, and three recruited males only. All the sick participants had gastrointestinal symptoms. Different methods were used to assess H pylori infection either alone or in combination: histology (11 studies), culture (3), rapid urease assay (5), serology (3), urea breath test (2) and PCR (4). Ten of the 13 studies were conducted on normal weight subjects, two on obese subjects and one on subjects of different body weights. Due to the different gastric ghrelin parameters assessed, a meta-analysis was not possible. Five studies assessed gastric ghrelin contents: one found it to be lower in H pylori positive subjects , three [6, 18, 44] found no significant difference between H pylori positive and negative participants, and one  found increased levels in H pylori positive participants. Isomoto et al  compared gastric ghrelin peptide contents in the endoscopic biopsies from the corpus of 56 H pylori positive and 25 H pylori negative subjects using radio-immunoassay. They reported significantly lower gastric ghrelin content in the H pylori positive subjects than the H pylori negative subjects. Roper et al  studied 216 adult males of normal BMI presenting for routine endoscopy consisting of 120 H pylori positive and 96 H pylori negative subjects. Although they did not find any significant difference in the gastric ghrelin levels between H pylori positive and H pylori negative subjects, they reported a very wide variation in the concentration of ghrelin in the gastric juice (from <80 to 776,000 pg/ml) with the H pylori positive subjects having higher gastric juice ghrelin levels than the H pylori negative subjects. Choe et al  did not find any significant difference in the gastric ghrelin levels between H pylori positive and H pylori negative subjects using biopsied tissues. Four studies examined the expression of ghrelin mRNA in gastric mucosa [19, 36, 37, 40]. Three studies found ghrelin mRNA expression to be lower in H pylori positive subjects than in H pylori negative subjects, while Jun et al  found no difference. Five studies assessed the quantity of ghrelin immunoreactive cells in the gastric mucosa [36, 40, 47–49]; all of which found that H pylori positive subjects had fewer ghrelin-producing cells than in uninfected subjects. However, in the study by Isomoto et al , this difference did not achieve statistical significance. Five studies compared the various gastric ghrelin parameters before and after H pylori eradication [6, 23, 36, 46, 48]. Choe et al  did not find any significant difference in the ghrelin concentration in the antrum, corpus and fundus pre- and post- H pylori eradication. Lee et al  reported a randomized controlled trial on H pylori positive volunteers without peptic ulcer or any other gastrointestinal symptoms in which the treatment group received triple H pylori eradication regimen while the control group did not receive any treatment. These authors reported a significant increase in gastric ghrelin mRNA expression following eradication compared to the control group. Osawa et al  also reported an increase in ghrelin mRNA expression following H pylori cure. Although Isomoto et al  found a tendency towards increase in ghrelin mRNA expression following cure of H pylori, this increase was not significant. Tatsuguchi et al , on the other hand, found an increase in ghrelin immunoreactive cells following H pylori eradication in 50 patients with either peptic ulcer disease or gastritis, while in 11 patients who did not respond to eradication therapy, there was no difference in the number of ghrelin immunoreactive cells pre-and post-eradication therapy. Three studies [36, 47, 49] found a negative correlation between ghrelin producing cells in the gastrum and the severity of H pylori infection. Gastric ghrelin content and gastric ghrelin mRNA expression were both positively correlated with plasma ghrelin concentration [36, 46]. The potential role of ghrelin in body mass regulation makes understanding its interactions with Helicobacter pylori, a highly prevalent gastrointestinal infection, important. To address this issue, we asked three questions: how does H pylori infection affect circulating ghrelin levels; how does eradicating H pylori affect circulating ghrelin; and how does H pylori infection affect gastric ghrelin and ghrelin producing cells. The results of our analysis has conclusively shown that circulating ghrelin levels are significantly higher in H pylori negative people than in those infected with H pylori (P = 0.00001). Our results also suggest that eradicating H pylori does not have any significant effect on circulating ghrelin. Although there was no significant heterogeneity between the group of studies that compared circulating ghrelin concentrations before and after H pylori eradication, this result should be interpreted with the following caveats in mind: 1) three of the studies [34–36] included in the meta-analysis came from the same research group; and together accounted for 29% of the effect size; 2) the paper by Osawa et al  which reported higher ghrelin levels before H pylori eradication compared to the levels after eradication on its own contributed 26.2% of the effect; and 3) the sample sizes of most of the other studies were relatively small. Interestingly, all the smaller studies, except one, found higher circulating ghrelin levels post-eradication. Even among the subjects studied by Osawa et al , plasma ghrelin increased in 50 patients and decreased in 84 patients, although the overall effect was a decrease post-eradication. They were however, able to show that pre-eradication elevation of ghrelin was associated with a fall in ghrelin post-eradication. In our unpublished data, we also found that elevated ghrelin concentration pre-eradication was associated with a fall post-eradication. These two observations suggest that in addition to other factors, the pre-eradication ghrelin level determines the direction of response of ghrelin post-eradication. The heterogeneity of the studies examining the effect of H pylori on gastric ghrelin expression as well as the small number of studies that examined different aspects of this relationship did not allow a meta-analysis to be performed. However, the descriptive data suggests that available evidence is still discrepant; although the weight of evidence seems to favour lower ghrelin mRNA and ghrelin immunoreactive cells in association with H pylori infection [19, 36, 40, 47–49]. The ultimate effect of H pylori on gastric ghrelin appears to be dependent on the duration of infection and the extent of H pylori-induced damage to the gastric mucosa. At least three studies found a negative correlation between number of ghrelin producing cells and the severity of H pylori infection [36, 47, 49]. The close anatomical proximity between the site of H pylori infection and the site of ghrelin production might result in the loss of ghrelin producing cells as part of the H pylori associated gastritis, causing reduced ghrelin production. However, such effect will not be restricted to H pylori infection and could occur in any other condition associated with gastritis. For example, Checchi et al  studied 233 patients with autoimmune gastritis (indicated by elevated parietal cell antibody (PCA)) and 211 control subjects, and found that mean serum ghrelin levels in PCA positive patients were significantly lower than in PCA negative patients, similar to the results found in H pylori infection by some studies. This decrease remained significant even after excluding patients with H pylori infection, suggesting that the H pylori infection was not necessarily responsible for the reduction in serum ghrelin. Again, the region of the stomach biopsied could also affect the results. Jang et al  reported that after ulcer healing and H pylori eradication, there was a significant increase in the levels of ghrelin mRNA. But while corpus ghrelin mRNA increased after cure and H pylori eradication, anthral ghrelin mRNA decreased, suggesting a differential response by the ghrelin producing cells in the different regions of the stomach. In healthy H pylori infected subjects however, Lee et al  found a significant increase in fundic ghrelin mRNA after eradication of H pylori (P = 0.0002) but no change in the anthral ghrelin mRNA (P = 0.5), suggesting a more complex relationship between gastric ghrelin production and H pylori infection. Teasing out this relationship will require more rigorous investigation. If H pylori infection is associated with a lower circulating ghrelin, it is biologically plausible that its eradication will be associated with an increase in circulating ghrelin. But if H pylori reduces circulating ghrelin by destroying ghrelin producing cells, then the effect of eradicating it on circulating ghrelin would depend on the duration of infection, the amount of damage to ghrelin-producing cells, and the time it takes for these cells to regenerate. Indeed several studies have found a negative correlation between the number of ghrelin producing cells and the severity of gastritis [36, 47, 49]. And in one study, there was no change in ghrelin levels post-eradication after 4 weeks of follow-up, but the level progressively increased with follow-up, achieving, in some subjects, significant increase after 6 months of follow-up . In contrast, mice infected with H pylori for 6-8 months had higher ghrelin levels compared to time-matched controls, which normalised two months post-eradication . However, Masaoka et al  did not find any change in circulating ghrelin levels 2 years after successful eradication of H pylori in an adult man. The discrepancy in the response to H pylori eradication could also be related to the strain of H pylori. Isomoto et al  found that strain diversity in H pylori was associated with plasma and gastric ghrelin levels in humans. Patients with type I strain (which express the virulence factors cytotoxin-associated gene product (CagA) and Vacuolating cytotoxin A (VacA)) have lower circulating ghrelin levels than those with the less virulent type II strain which does not express the virulence factors. This finding also argues for a possible racial difference in the association between circulating ghrelin levels and H pylori infection: in regions where type I strain is dominant, one would expect to see reduced circulating ghrelin levels. While such speculation is attractive, it might not be entirely correct . In this review, the effect of region and country of study on the relationship between H pylori and ghrelin was very weak, and appears to be confounded by several other factors. The underlying clinical condition of the subject might also be affecting the results. Suzuki et al  studied plasma ghrelin in patients with peptic ulcer disease. They found that plasma ghrelin levels were significantly higher in patients with duodenal ulcer as well as those with gastric ulcer compared to those with chronic gastritis. Among the subjects that were H pylori positive, plasma ghrelin was significantly higher in patients with duodenal or gastric ulcer than in those with non-ulcer chronic gastritis. After treatment for the ulcer (with healing), no significant change was found in the plasma ghrelin levels (i.e. pre-and post eradication levels were similar). Most of the studies reviewed here recruited subjects with varying degrees and types of gastrointestinal pathology. If each of these gastrointestinal diseases affects ghrelin production differently as suggested by Suzuki et al , then the discrepancies noted in this review are to be expected. Compensation from other sources of ghrelin production might also explain the various inconsistencies highlighted in this review. For example, Suzuki et al  infected Mongolian gerbils with H pylori and assessed the plasma and gastric ghrelin levels at 17 and 23 weeks after the infection. They found a significant decrease in gastric ghrelin in the H pylori positive gerbils compared to the controls, but also found a significant increase in plasma ghrelin levels in the H pylori positive group. This same group also found increased plasma ghrelin and decreased gastric ghrelin levels in IL-1R1 knockout mice  suggesting that other sources of ghrelin might have contributed to the increased plasma ghrelin. The major limitation of this review is the use of only English language papers, which raises the possibility of some publication bias. Another limitation in conducting this review is that all except one of the papers were observational studies, most of which did not primarily set out to assess the relationship between ghrelin and H pylori; but assessed both parameters in relation to other objectives. Well designed randomised clinical trials are needed to verify the conclusions made by this review. Also, many of the studies included participants with diverse disease conditions whose impacts on ghrelin secretion have not been investigated before. The best approach to solve the riddle of the relationship between ghrelin and helicobacter pylori might be to study otherwise healthy participants with asymptomatic H pylori infection. From available evidence, circulating ghrelin concentration is lower in people infected with H pylori compared to those not infected with the bacterium. However, a more complex relationship exists between circulating ghrelin levels and eradication of H pylori. This relationship may be modulated by the strain of infecting H pylori, the duration of follow-up, the extent of H pylori-induced gastritis and other underlying pathology. More studies are needed to further elucidate the impact of H pylori eradication on circulating ghrelin concentration. Chidi V Nweneka and Andrew M Prentice contributed equally to this work. The authors wish to acknowledge all the authors that responded to our inquiries particularly those that provided us with their raw data sets. The authors declare that they have no competing interests. Funding for this study was provided by the UK Medical Research Council. CVN conceived the paper, conducted the literature search, initial analysis and took lead in the writing. AMP critically reviewed the analysis, and the initial drafts, and participated in writing subsequent drafts. Both authors read and approved the final manuscript.